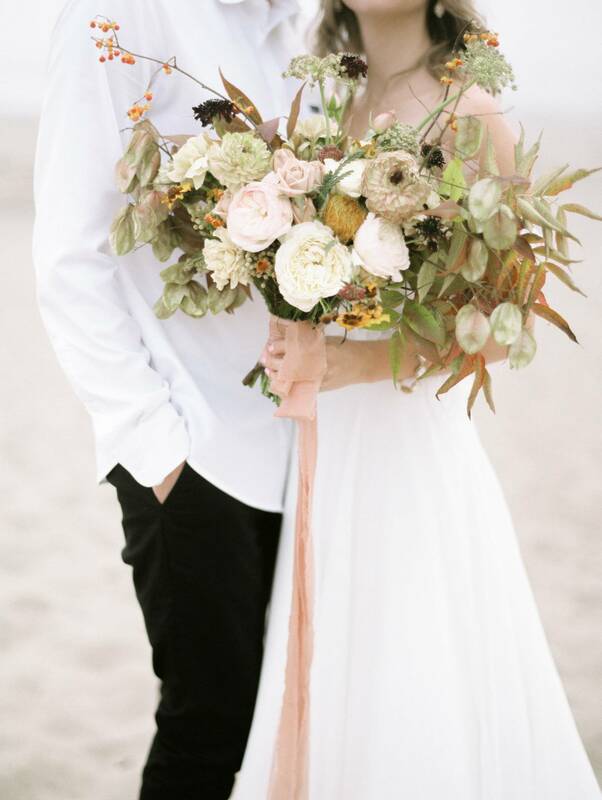 Inspired by the beautiful and majestic colours and textures of the Big Sur coastline, RACHEL HAYLIE PHOTOGRAPHY captured this gorgeous couples love and affection for each other whilst demonstrating that less is more when you have such striking landscapes to play with. "We wanted to keep the bride and groom portraits simple to let the most important aspect of a wedding day take centre stage, the couple and the love between them. 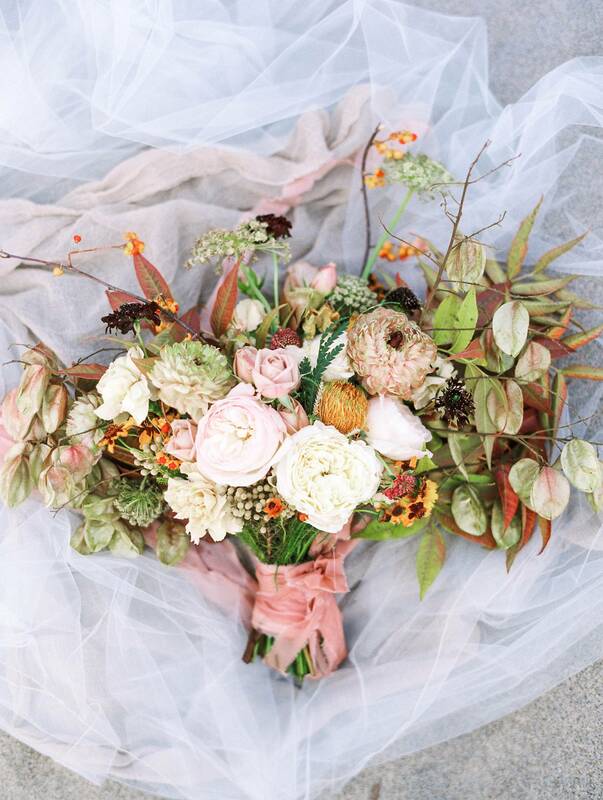 And with details like a gorgeous ring from Wedding ring designer SUSIE SALTZMAN, unstructured, sweeping florals and a beautifully romantic flowing gown from Bridal gown designer MADE WITH LOVE BRIDAL, there is not much else that is needed to inspire the true essence of a wedding day, that being the closeness and love between the couple. The stunning invitation suite by SHASTA BELL CALLIGRAPHY portrayed an ethereal beachside celebration, as did the tablescape set-up fashioned from vintage beauties from Found Vintage Rentals. Every detail from the whimsical wedding cake, to the subtle seashells told a story of coastal romance in a pure, simplistic and timeless form. We encouraged Crysta and Dylan to take in the surrounding beauty of the sea, to be present and embrace the moment they were in together and let the grandeur of love fade everything else away." Bridal gown designer MADE WITH LOVE BRIDAL is a valued member of the MAGNOLIA ROUGE VENDOR GUIDE. You can see more of their designs in their portfolio. As an online boutique store MADE WITH LOVE BRIDAL are committed to designing, creating and delivering the most beautiful wedding dresses they can dream up. Designer Carla says "We think our love is evident in every email and each dress. 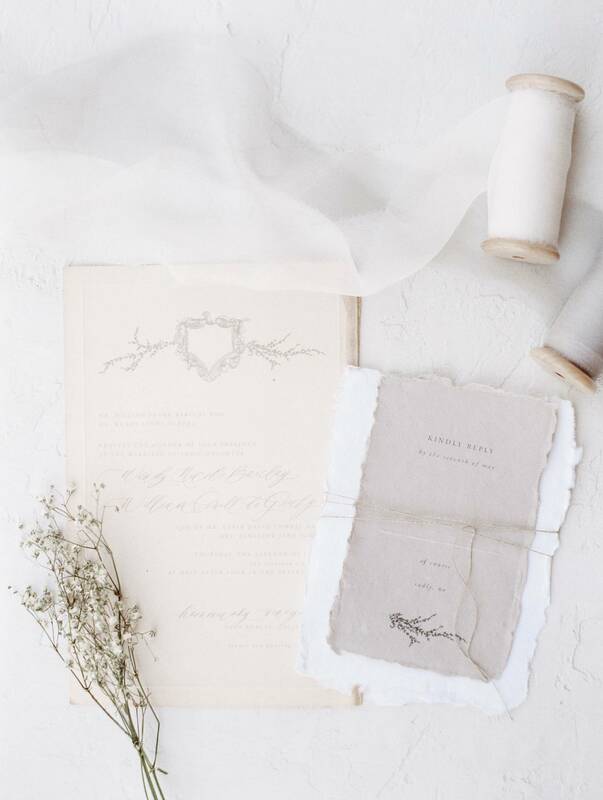 Everything we do is done with LOVE, from our personalised service to the styling appointment, to the follow-up correspondence. This is an old fashioned approach to service that we pride ourselves in." See some of their Modern & elegant wedding gowns in this feature here. Wedding ring designer SUSIE SALTSMAN offers a bespoke alternative to the traditional engagement ring purchase by helping couples all over the world custom-make fine jewellery for the moments that truly deserve to be 'one of a kind'. Based in New York, Susie works with brides all over the world and you can see more her portfolio in our vendor guide here.